Subject: A new video training program "Bare hands warrior. Weapon disarming mastery"
then this step-by-step guidance may be that “wonderful recipe” that you’ve been looking so long for. We won’t talk about the secret methods and pseudo technologies which promise you fast results without putting in any effort. Simple algorithms and methods that we want to teach you in this video course have helped hundreds of our trainees, and we are sure that they will help you too. Of course, to attain all this you will have to put in some effort. We don’t think you’ve ever met a person who could master some solid skills just sitting on a sofa and watching TV the whole day. First of all, this video course has nothing in common with those training courses that you’ve seen before. There is no theory in it. There are only practice proved methods of teaching the most efficient ways of disarmament according to the Kadochnikov System, which are as efficient today as they were many years ago. And they are easy to learn. This course is so compact that you’ll be able to learn it in a day. You’ll quickly understand (and more than likely you’ll be amazed!) by the simplicity of this wonderful method which has helped hundreds of people just like you to quickly master these skills. TThe skills that you’ll acquire are definitely something more than just knocking away or taking a weapon from your opponent. Because you can use this system to efficiently control your body in a dangerous situation. 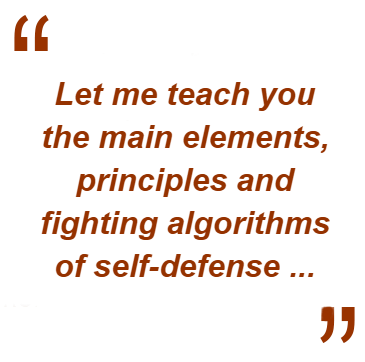 The Kadochnikov System’s approach to a human’s body has one significant peculiarity that makes it different from all other similar schools, and explains its high efficiency of practical application in the most extreme situations when one’s health and life are in danger. The Kadochnikov System regards a human body as a whole system. That’s why any move should be made with the whole body. It doesn’t matter whether you or your opponent uses weapons. You need to be well trained in order to master disarmament. Well, that’s not true! Learn this simple technique, which will help you to form the efficient skills needed for your opponent’s disarmament according to the Kadochnikov System. ... we can perfectly understand you if you don’t feel confident right now. Many people felt the same until they found this System, which has changed their lives. That’s why we’ve spend so much time creating this program. Your muscle tonus will be constantly rising. That means that day by day your muscles will be more elastic and less tired. Your skills will be improving. It won’t require any additional efforts from your part. The natural mechanisms of self-training will be set in your body. The principle of this program. As it’s a very inexpensive offer… you may ask the following question: what is the catch? We’d like to assure you: there are no traps at all. We offer you this fantastic offer just for $67 just to show you how useful it is. There is a guarantee for money refund. We 100% guarantee that you’ll like this course; otherwise we’ll refund your money and let you keep the course. Just write us or call our customer support service, and we’ll refund your money without asking you any questions. A step-by-step video training program "Bare hands warrior. Weapon disarming mastery". "Bare hands warrior. Weapon disarming mastery"
YES! I’d like to master the most efficient ways of disarmament according to the Kadochnikov System. 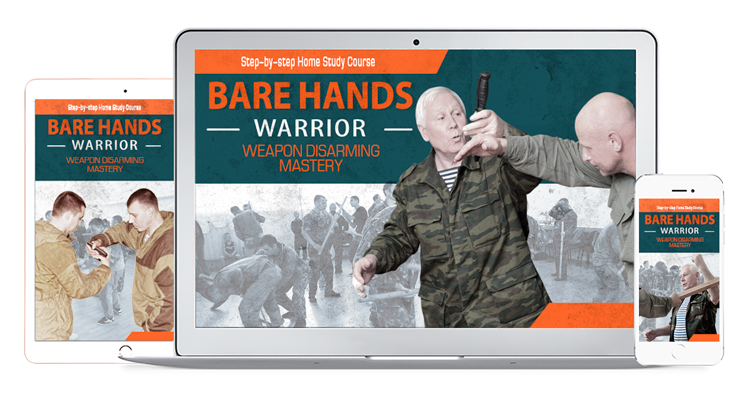 I’ll receive a homestudy course which consists of 6 instructional videofilms "Bare hands warrior. Weapon disarming mastery", filmed in high quality using professional equipment. I won’t risk anything because I have a more than 100% guarantee. If I don’t get any results having used your program for 6 months, then my money will be fully refunded. I won’t be asked any questions or demanded any explanations. Thanks for finding time and reading this letter. We’re looking forward to seeing you again. We’ve prepared this offer for a limited time only. It will be closed soon. We 100% guarantee that you’ll like this course; otherwise we’ll refund your money and let you keep the course.